". . . they were basically saying you can have the best idea in the world, but if you don’t advertise right you are just not going to go anywhere." Quietly weaving through Noyo Harbor, Dan Platt, a well-known local fisherman along the Mendocino Coast, points to a boat that towers over the others in the harbor. “This boat just got back from Alaska where the owner was packing salmon,” says Platt, who proceeds to explain the process for packing salmon and how the Fort Bragg fishing community supports these vessels. This is just one of the many interesting anecdotes you will learn about fishing life in Noyo Harbor from Platt on his scenic boat tours of Noyo Harbor that kicked off in May of this year. Noyo Harbor Tours with Captain Dan, gives people a unique opportunity to learn about the Mendocino Coast’s local fishing culture, history and harbor wildlife, all from a comfortable eco-friendly electric boat, the Noyo Star. The idea to offer these tours in Noyo Harbor came to Platt a few years ago, after giving some visiting family a private tour of the harbor. “They came to Fort Bragg and wanted to go on a boat ride, but the ocean was rough, so I took them for a ride in my Boston Whaler just around the harbor and they had a really great time. So that kind of started the idea,” Platt recounted. Platt is the ideal tour guide of the NoyoHarbor given his long history of fishing in the area. Originally from Point Arena, Platt started fishing with his father when he was fifteen, and then, directly out of high school, he moved to Fort Bragg to work on commercial fishing boats. “I was told if you want a job on a good boat you have to go to Fort Bragg,” explained Platt. Platt has been a staple in the community, working on commercial boats for 15 years. He knows all there is to know about Fort Bragg, Noyo Harbor and the fishing community along the Mendocino Coast. When his new business venture came to mind he didn’t jump in immediately, but spent some time mulling it over and doing research on various touring boats. “I have been thinking about it and developing the idea for quite a while, and at the same time I was busy with my other businesses. Then I took some classes through West Company and decided to do it,” said Platt. West Company, a local non-profit that supports the development of small businesses, helped Platt obtain a business license, and develop a business plan. They examined areas such as costs to start the business as well as his potential income. Additionally, Platt took several classes offered through West Company, including ‘Marketing Boot-Camp for Startups’ because advertising and marketing for his business was one of his biggest concerns. “I saw some things in the classes I took about advertising through West Company and they were basically saying you can have the best idea in the world, but if you don’t advertise right you are just not going to go anywhere,” said Platt. Knowing he would need to market to out-of-towners for his tours, Platt invested in enlarging his advertising reach by developing a business website, expanding into social media, such as Facebook and Yelp, and outreach to local hotels with brochures. According to Platt, business has been good considering that it is their first year. “The last three weeks of summer we have gotten really busy and we started doing three or four tours a day for four or five days a week, which was encouraging," said Platt, “I think with the right advertisement and return customers we might do well next year. Platt plans to continue working as a commercial fisherman and diver for as long as his body will allow it, but is grateful for establishing a new business that uses the knowledge he has acquired over many decades. “Because of the restrictions in the fishing business, never really knowing what is going to happen next or if you will be allowed to fish or not, it is nice having alternate income. And I love the water so much that I need to be around it, so I figured this is the way I can make some money and still be out in the water,” said Platt. 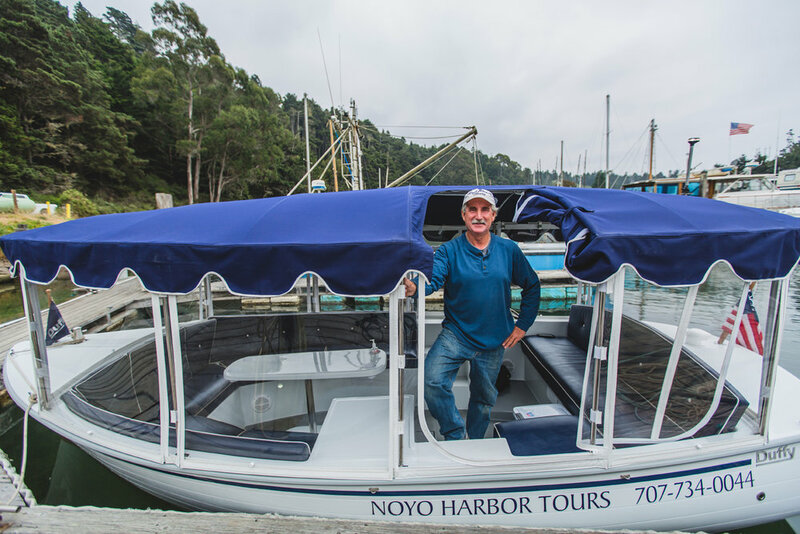 For more information about Noyo Harbor Tours, such as tour schedules and price tickets, call 707-734-0044 or visit their website at noyoharbortours.com.